A Corby baby died after a series of five fatal failures that amounted to neglect, a coroner ruled yesterday (Wednesday, April 3). Jorgie Stanton-Watts, who was aged just 23 months, died on Skylark Ward at Kettering General Hospital in October 2016 after a series of failures that means basic medical care was not administered correctly. The ruling - which is an unusually rare finding for an inquest to make - was delivered yesterday after three days of complicated and distressing medical evidence during which two experts agreed that key mistakes had contributed to Jorgie’s death. During the inquest, medical and nursing staff took to the stand and admitted again and again errors that had been made were ‘unacceptable’. FAILING ONE: A decision by consultant paediatrician Dr Rao on October 2 to stop a hydrocortisone drip that was helping Jorgie fight infection. This should have been continued for four to five days. Two medical experts agreed this contributed to her death. FAILING TWO: A failure to notice Jorgie’s negative fluid balance. Jorgie had more fluid going out than she was taking in. Nappies weren’t weighed ‘in a timely fashion’ and the fluid balance discrepancy was ‘not effectively actioned’. Medical expert Dr Stanhope said that if the fluid balance had been effectively treated, Jorgie would not have died. FAILING THREE: Blood tests were not carried out. A blood test ordered on the morning of October 5, the day of Jorgie’s collapse, wasn’t done until 6pm and by the time the results were back ‘it was too late to do anything about it’. FAILING FOUR: Advice was not sought from specialists at Leicester Royal Infirmary until it was too late. Jorgie was a ‘high risk patient in a high risk situation’. LRI knew her and shared her care. It was known she had a central line infection and that she was a child that could deteriorate very quickly. Medical staff accepted that now, advice would be sought from a tertiary centre ‘much earlier’. FAILING FIVE: An inability to escalate Jorgie’s Pews (Paediatric Early Warning System) Score. When Jorgie was found to have a high Pews score, her care should have been escalated and observations done more frequently. These weren’t carried out. Mr Barlow recorded a cause of death of multi-organ failure caused by hyponatremic dehydration and sepsis. He said that the three contributory factors were bronchiolitis obliterans, adrenal insufficiency and hypopituitarism. He added: “I’ve been asked to consider the question of neglect. “It’s nothing to do with negligence. It means there was a gross failure to provide basic medical attention for someone in a dependant position who clearly needed it. Jorgie's family speaks: "We watched her failing. Nobody listened." “I do find that neglect was made out,” he said. 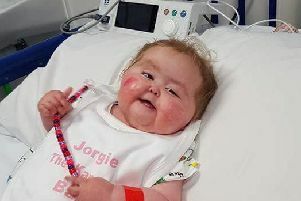 “Jorgie died of the effects of dehydration and sepsis to which neglect contributed. The corner said that an official Prevention of Future Deaths Report was not triggered, partly because he had been impressed by the evidence of the new Divisional Head of Nursing for paediatrics and neonates Simon Hardcastle who had told the court of the many ways in which changes had been implemented on Skylark ward since Jorgie’s death. Speaking earlier in the day, Mr Hardcastle said that he had been appointed to produce a report into Jorgie’s death after the police investigation had concluded in 2017. He said: “We ensure we provide regular training on the Pews system for medical and nursing staff. “We’ve implemented a Pews audit which is carried out every month at least. We take 20 charts and look through them and any errors are fed back to individual staff or to staff in general if needed. “We are introducing a new fluid balance chart. We’ve worked with nurses to develop that. It’s something they’re already using on a trial basis. “We’ve just reviewed guidelines on whether children admitted should be weighed and that’s going through a three month trial at the moment. “The way we run ward rounds has changed. Mr Hardcastle added that more emphasis was placed on safe staffing with all ward managers involved in a daily safety meeting to address staffing levels. Several nurse associate posts had been implemented and a new ward structure freed up matrons and ward sisters to ‘get to grips with running the ward’. He added: “I think the learning that has taken place (after Jorgie’s death) has really helped with the changes that have been implemented. Also giving evidence yesterday morning was Paediatric and Neonatal Matron Donna Mason. Although Ms Mason had not treated Jorgie on her admission in October 2016, she said that she had met the family on previous occasions. She was asked about the five hour delay in weighing Jorgie’s nappies, which meant that a fatal fluid imbalance was missed. She said: “I don’t think a five-hour delay was acceptable. She admitted that nurses had not repeated hourly observations after Jorgie’s Pews score was raised to nine, and that an s-bar chart wasn’t completed. Solicitor for the Stanton-Watts family Oliver Williams said that this led to inaccurate record keeping. Ms Mason said that the practise of writing observations on a piece of scrap paper then transferring them to the patient’s chart afterwards - as had happened in Jorgie’s case - was ‘unacceptable’. “You should take the chart with you to the bedside,” she said. After Jorgie’s collapse on the evening of October 5 she was taken to Leicester Royal Infirmary but by then there was no effective treatment they could give to save her life. She died in her dad’s arms on October 8. After yesterday’s verdict, Kettering General Hospital’s Director of Nursing and Quality, Leanne Hackshall, said: “Following today’s conclusion by the coroner we would like to extend our sincere apologies to Jorgie’s family for the points in time when we could have done more to support her. “Jorgie was a regular inpatient at Kettering General Hospital and our paediatric team supported her needs on many occasions working closely with specialists from Leicester Royal Infirmary. “The events leading up to her death have been subject to extremely detailed reviews in order to identify what more the Trust could have done to support her treatment. “Those reviews found there were aspects of her care and monitoring that could have been better and we fully accept that. “As a result we have carried out significant extra training and reflection with our team to address all the issues raised and improve our processes for the close monitoring of children with complex conditions.